Whew! I've just met what I hope is my last book deadline of the year. I turned in Let It Bleed, the fourth book in the WVMP Radio series. And...well, it's rough. Luckily, my motto is, "Don't fear the rewrite!" 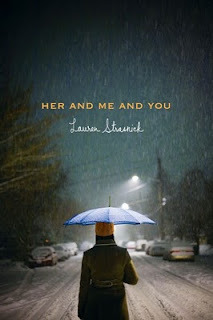 Moving on, our latest Girlfriends Cyber Circuit'er is Lauren Strasnick, whose second book, Her and Me and You, came out last week from Simon Pulse, who have generously offered up a copy for giveaway! I recently read and loved Lauren's debut, Nothing Like You. I can definitely see why it was nominated for a Rita Award for best Young Adult romance. The characters are painfully real, and it was so easy to get inside the main character's skin. I couldn't put it down! Oh god, I give my characters such miserable lives! Ha. I’d have to choose Holly from NOTHING LIKE YOU. 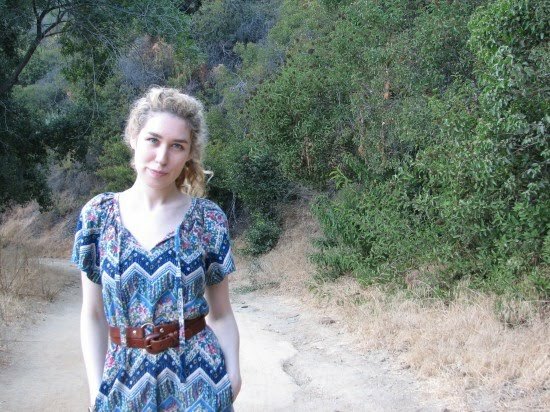 She lives in Topanga Canyon, listens to good classic rock, eats bean & cheese burritos, has a sweet dog named Harry, and lives next store to an adorable dude. Fred, from H&M&Y! He’s cute and he wears corduroy. Spinal tap! No joke! I was four. See question 4. Also: raw chicken, flying, freeways, death. Unless she's talking about the movie This is Spinal Tap, and actually at four years old, that might be kinda traumatic, too. If you're not a twin, would you want to be a twin? If you actually are a twin, what's your favorite book/movie/TV portrayal of twins? Deadline: Friday, October 15, 11:59pm eastern. Thanks to Lauren for stopping by, and congrats on the new release! My husband's sisters are twins but they were so different from each other I never had a problem telling them apart. One was an out going cheerleader, the other a shy tomboy. I don't think I would want have a twin though. I've heard a lot about this book in the blogosphere - looking forward to reading it! I would not want a twin. There is just too much competition with just one of me ;) I have not dated a twin, unfortunately. I would have liked to try it once. This book looks great, I'll have to keep a look out for it.